All went well last night. Granted it is not cold like the great white north, but for the gulf coast, it is a decent test. I took Sarge's advice and put the down between the jungle blanket and the hammock. Temps got to about 35 not counting any reduction by a slight breeze. I know Sarge got his Jungle Blanket UQ to 38 with no extra, but my tests did not get me there, so I added the throw. To quote my wife "I have been trying to wake you up for a half hour , so I guess you were not cold!!". She tried calling to me from the deck, and ended up having to walk out and shake the hammock. My guess is this setup will take me at least to freezing. Waiting for the temps to drop into the 20's later this winter to see just how far I can go with it. Clothes - fleece 'lounge pants' (PJ bottoms), long sleeve t-shirt, light cotton vest, no socks. 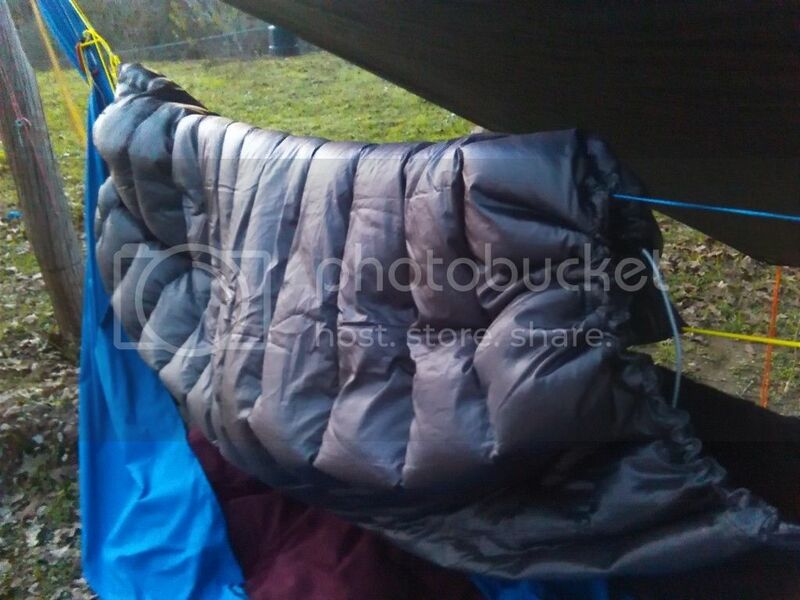 Top - 0 degree sleeping bag open used as a TQ. since I was testing the underinsulation, I wanted to be sure the top did not factor into my cold. All the yellow shock cord and ridgeline tighten up when I get in the hammock. The pictures make the angles look weird, but it works in practice.
. Jungle blanket moved, out of the way to show the modified Costco throw. Scott wrote: I have joined the cool kids and now have an UnderQuilt. 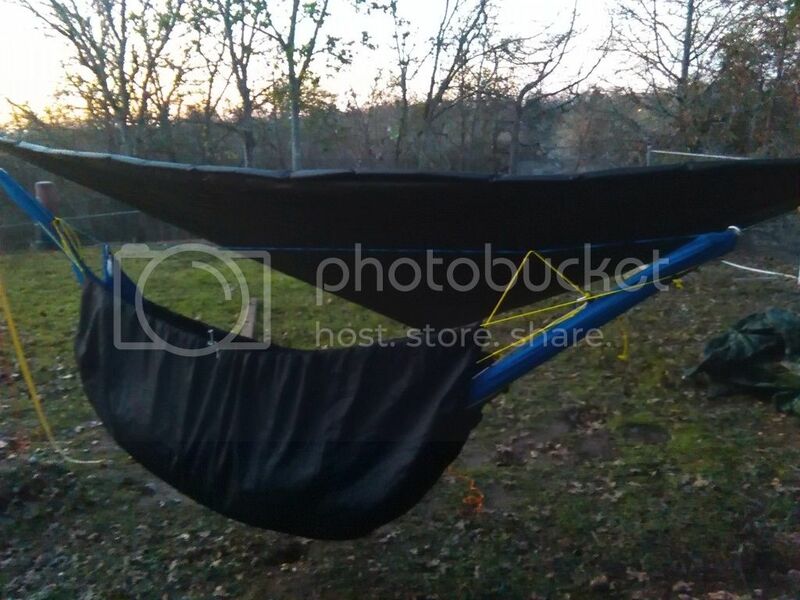 Ok starting to price out my underquilt which will go under my ENO Double nest set. I have a wool blanket which will go under me as well. What sice should I get for sock cord??? Thinking 3/16 or 1/4 inch what say you. My top quilt will be a 3 season sleeping bag for now. I'd go ahead and buy 100 feet. MYOG gets addicting and there's lots of shock cord used. I want to adjust my UQ system a little and make it modular using the snaps. 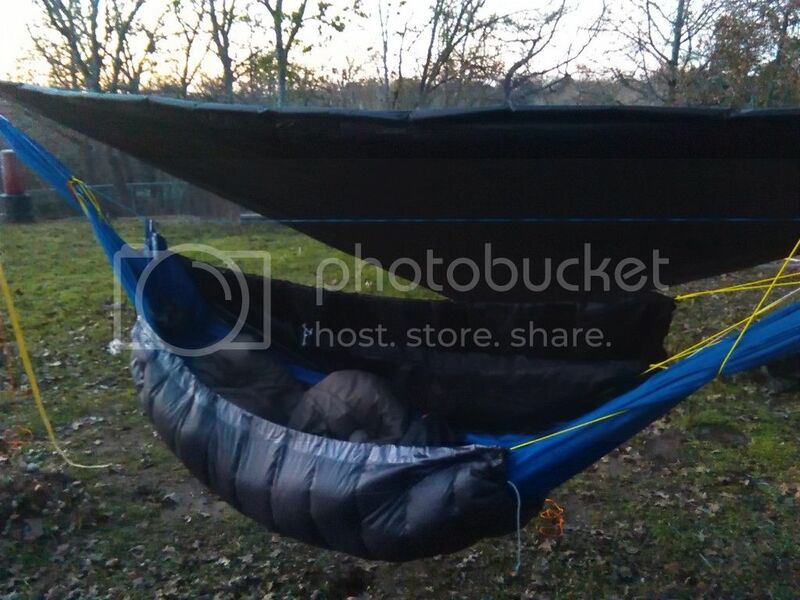 If I start with the jungle blanket, then snap in a full costco throw (probably with the seams ripped one direction to get more loft), then snap in my costco quilt modified to 45x60 as a booster - how low do you think I could get for temps? I probably won't get to it for a little while to construct it, and definitely won't be able to test until deeper into the winter. It would not be ultra light, but it would be modular.